Antigen-specific therapy of rheumatoid arthritis. Expert Opin Biol Ther. 2008 Feb;8(2):191-9. Ichim TE, Zheng X, Suzuki M, Kubo N, Zhang X, Min LR, Beduhn ME, Riordan NH, Inman RD, Min WP. Background: Immunotherapy offers the promise of antigen-specific suppression of pathological immune responses in conditions such as autoimmunity and organ transplantation. Substantial advances have been made in recent years in terms of understanding basic immunological mechanisms of autoreactivity, as well as clinically implementing immune-based therapies that are antigen nonspecific. Objective: To provide an integrated overview of the current state of the art in terms of antigen-specific tolerance induction, as well as to predict future directions for the field. Methods: Examples of successes and failures of antigen-specific immunotherapy were sought. 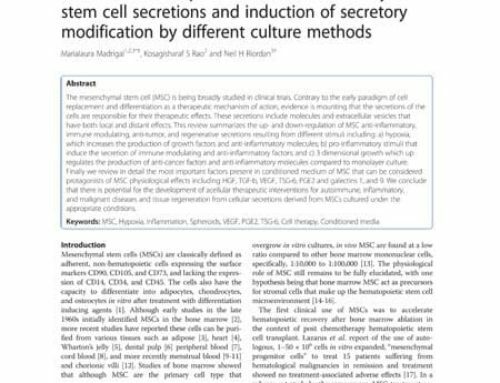 Particular attention was paid to the well-established collagen II-induced model of arthritis. Results/conclusions: Previous failures of antigen-specific immunotherapy were associated with lack of identification of clinically relevant antigens, as well as inappropriate tolerogenic methodologies. The advances in proteomics combined with novel gene-specific immune modulatory techniques place today’s translational researchers in a unique position to tackle the problem of antigen-specific immunotherapeutic protocols.